"They glide across the paper with ease and are long-lasting, too." "For around $10, you get six pens—with a variety of sizes." "It comes in blue, black, or assorted colored packs." "Don't worry about smears—they’re totally smudge-resistant." "This set gives you 30 different color choices, including several neon shades." "This model has a bolder point than the classic." "It adds a bit of elegance to your journaling." "The tips are also self-cleaning, so you can mix and blend colors." If you don’t want to bother with a bunch of different products for your bullet journal, this Pilot retractable set is your best bet—which is why it’s our pick for best overall. 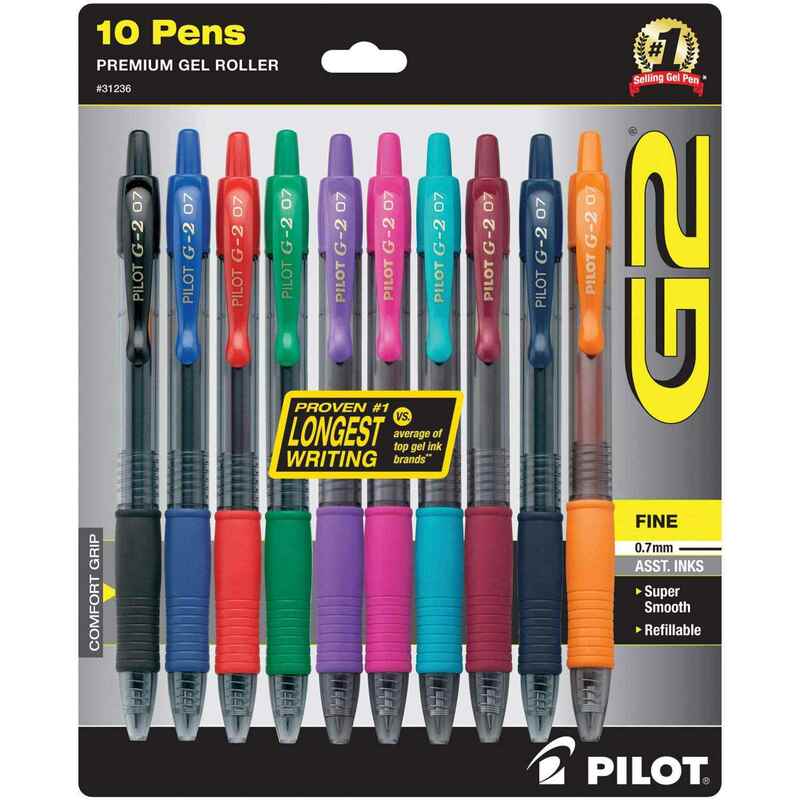 For under $15, you get ten pens in an assortment of fun colors. It has your basic black and blue, in addition to the classics like red, pink, purple, green, and orange. These retractable pens have gel ink with a super comfortable grip, and they’re refillable, so if one runs out, you don’t have to go buy a whole new pack. Thanks to a fine point, they’re perfect for writing your to-do list, notes, and reminders. Reviewers say they glide across the paper with ease and are long-lasting, too, making them an incredible value for your bullet journal needs. If you don't want to spend a lot of money on pens, it's easy to find a budget-friendly pen set for bullet journaling, and you don't have to skimp on quality, either. That's why the Sakura Pigma 30062 Micron Blister Card Ink Pen Set is a great deal. Not only do you get six pens for around $10, but each one in the set offers a different point size—ranging from 0.2 all the way up to 0.5 millimeters—giving you lots of flexibility even with the bargain price. The ink is fade resistant, promises no smears, and it won't bleed through most papers. It’s also pigment based rather than dye based, which means that it’s less susceptible to UV rays and chemical degradation. These retractable pens come in a 12-pack and feature pigment-based gel, with your choice of ink color (black, blue, purple, red, or assorted) as well as options for point sizes (ultra micro point, micro point, medium, and bold). The pens boast quick-drying, archive-quality ink, which means its both water and fade resistant. Plus, the pens themselves are stylish, with sleek metallic accents as well as textured grips that provide comfort. Online reviewers rave about how smooth they are to write with and how well the ink holds up on the page. If you’re someone who likes to go bold in your bullet journal, you’re going to love the 0.7-millimeter medium point on these felt-tip pens from Paper Mate. The 24-pack features vibrant "tropical vacation colors" to liven up your pages. Each pen also has a "point guard" that's meant to extend the life of the pen and keep it from fraying even with extensive use. And don’t worry about smears—they’re totally smudge-resistant, and the ink is water-based, so it won’t bleed through your pages. The ink is also fade resistant so you can preserve your creations for years to come. There's a reason Paper Mate is so popular, and online reviewers loved how versatile they found these pens. And while there are cheaper options out there, most agreed that these end up being a good value because they are long-lasting. If you're looking to add a bright pop of color to your bullet journaling, the Point 88 Fineliner Pen set has the color variety you're looking for. This set gives you 30 different color choices, including several neon shades. The pens are also precise: The metal-enclosed tip produces a 0.44-millimeter line width, giving you the ability to create really intricate drawings. Another cool feature? A long cap-off time means you don’t have to worry about ink drying out if you leave the cap off by accident! The hexagonal shape of the pens is designed for comfort and ease. Reviewers describe them as a cross between a pen and a marker—perfect for writing, but also great for detailed sketches. Just be careful when choosing your paper, as some people complained of bleedthrough. Check out our guide to the best notebooks you can buy today. You can never go wrong with a classic ballpoint, and these BIC pens are a tried-and-true choice. For around $10, you get a set of 24 pens—perfect for those who are constantly losing their writing instruments. At 1.6 millimeters, this model has a bolder point than the classic, so your writing will be a bit more vivid. They also feature BIC's proprietary Easy-Glide System ink, which is even smoother than the classic BIC system, making them ideal for lots of writing. A smoked barrel gives it a slightly different look than the classic BIC pen, but it's still translucent enough to see how much ink you have left. A few reviewers mentioned some issues with clumping, but for the most part, people love how well they work—and one even said the boldness of the ink makes them a good alternative to gel pens. The Pilot Metropolitan Collection Fountain Pen has an old-world feel, but it’s really easy to use. This one is all about the writing experience, and it adds a bit of elegance to your journaling. While fountain pens are typically much more expensive than your average writing instrument, this one is on the lower end of that price scale. Plus, it comes with one ink cartridge as well as a converter for bottled ink. Each pen comes in a gift box—making this a stylish gift for yourself or a recent graduate. Online reviewers were blown away by the quality at such an affordable price. Want to take a look at some other options? See our guide to the best fountain pens. While these pens are not going to be your primary writing utensils—you'll want something a bit less bold and precise—they're perfect for dressing up your journal with color, pattern, and art. The 10-pack includes a variety of bright colors and one blender pen. Plus, their dual nature offers versatility, with a flexible brush tip and fine tip in one marker pen. Depending on the pressure you use, you can create fine, medium, or bold strokes. The tips are self-cleaning, so you can mix and blend colors without a second thought. They’re also odorless, non-bleeding, and non-toxic—so a solid choice all around. Online reviewers say they work great for journaling, calligraphy, and more. If you're looking for the perfect journal to use with these pens, take a peek at the best self-journals. Our writers spent 1.5 hours researching the most popular pens for bullet journals on the market. Before making their final recommendations, they considered 15 different pens overall, screened options from 13 different brands and manufacturers, read 40 user reviews (both positive and negative), and tested 0 of the pens themselves. All of this research adds up to recommendations you can trust.